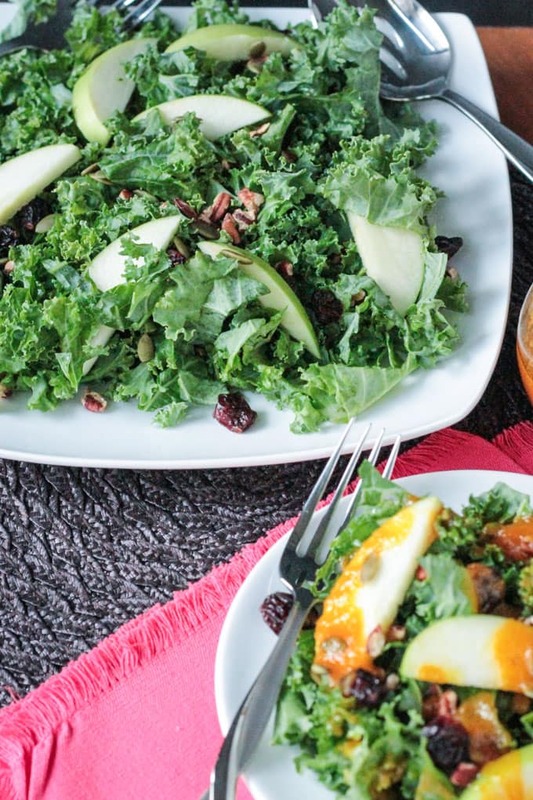 Autumn Kale Apple Salad – a nutritious hearty salad that’s tart, sweet, and crunchy. 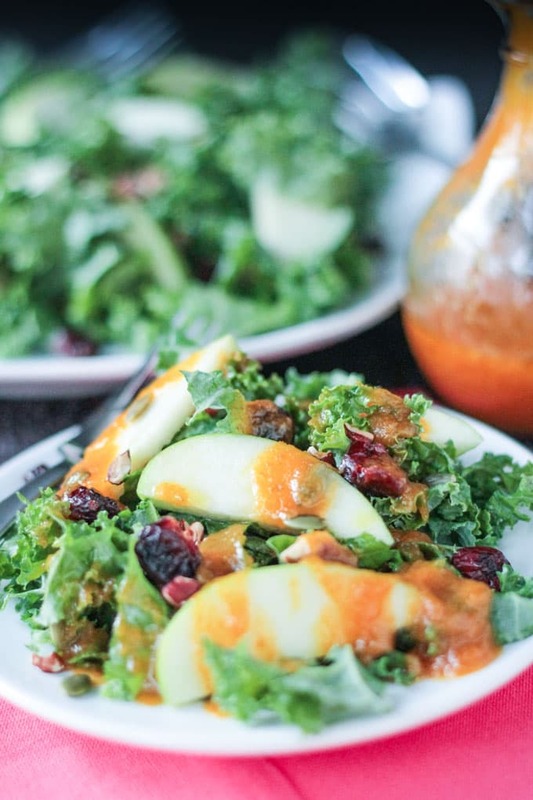 Drizzle it with this creamy dairy free Warm Pumpkin Vinaigrette! 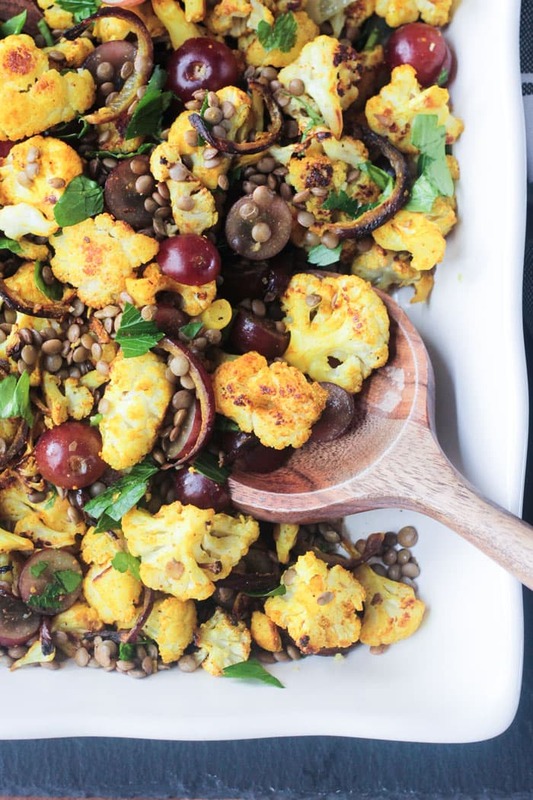 This simple lunch just screams fall and it won’t give you that afternoon food coma. 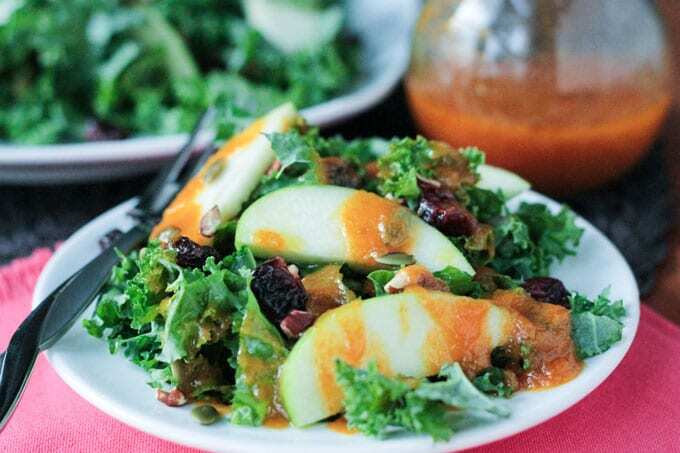 This Autumn Kale Apple Salad with Warm Pumpkin Vinaigrette would also be the perfect start to a heartier meal. Protein packed from pumpkin seeds and pecans, tart and sweet from apples and dried cranberries, bursting with vitamins and minerals from kale, and if that’s not enough, high in antioxidants from pumpkin and apple cider vinegar in the vinaigrette, this salad will make you healthier just by looking at it! Well, okay, maybe that’s an exaggeration, but it sure is healthy choice if you eat it and, luckily, it’s as delicious as it is nutritious. I didn’t really measure the salad ingredients as I was throwing them in the bowl, but I’ll do my best here to give you a general idea. 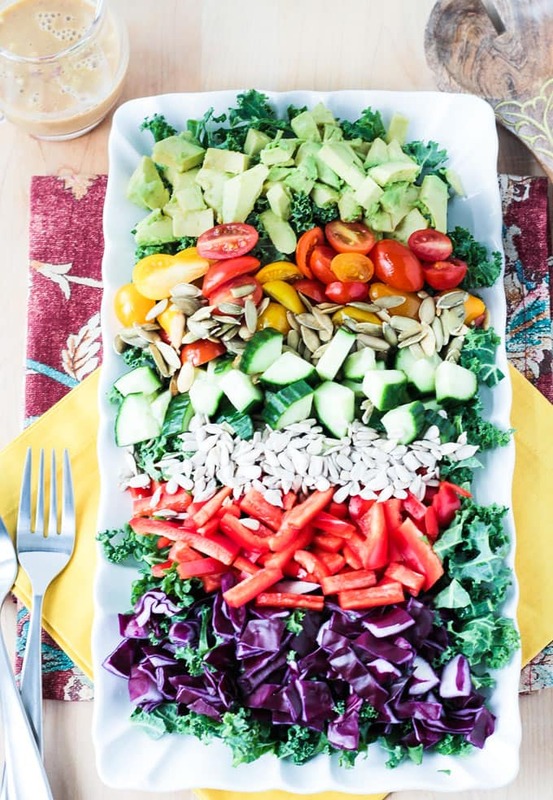 It doesn’t really matter though, throw in more nuts or seeds if you like or lessen those and up the amount of fruit…however you like your salad. The dressing amounts are exact, but you probably won’t use it all. Leftover dressing will keep in an airtight container in the fridge for a few days. I hope you love this Kale Apple Salad as much as I do. If you try it, please come back and leave me a comment below with your feedback and star rating. 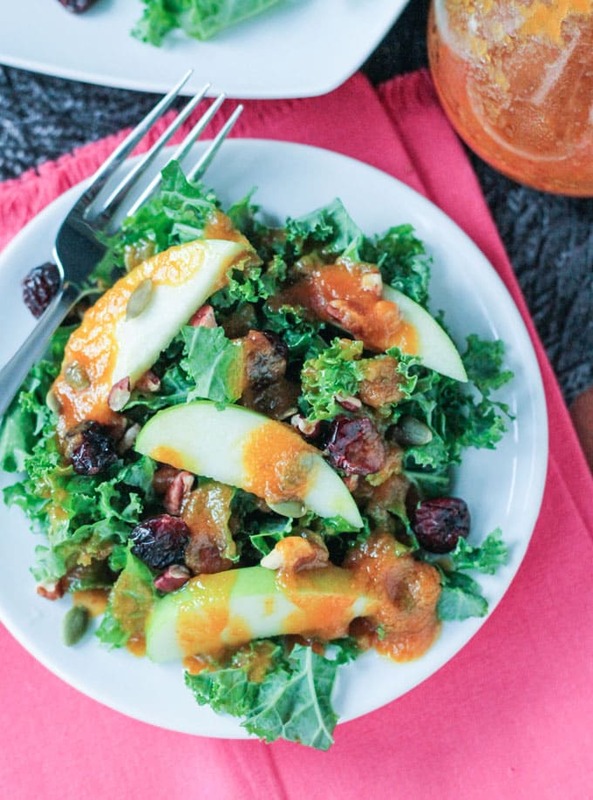 Autumn Kale Apple Salad - a nutritious hearty salad that's tart, sweet, and crunchy. Drizzle it with this creamy dairy free Warm Pumpkin Vinaigrette! Combine pumpkin puree, vinegar, maple syrup, shallot, salt and pepper in a small sauce pot. Mix well. Slowly drizzle in the olive oil, whisking continuously. Heat on the stove over med-low for a few minutes to warm, whisking often. While the dressing is warming, put all of your salad ingredients into a large bowl and toss well to combine. When dressing is warmed through, take off heat and pour over salad. (You certainly don't have to use it all. Use as much or as little dressing as you like. Store leftovers in an airtight container in the fridge for a couple days). Toss everything together to combine. ~ Store the salad and the dressing separately in air tight containers in the fridge if you have leftovers. I’m glad I stumbled across this – I made a salad last night with butternut squash, toasted walnuts, and Pecorino, and have SO MUCH kale left over. This looks delicious and different enough that I won’t mind serving it again right away! Oh, perfect! Your salad with butternut squash sounds delicious too! Thanks, Monica! Wow, love the idea of that warm vinaigrette! I’ve never come across pumpkin vinaigrette, sounds delicious! Perfect for autumn. 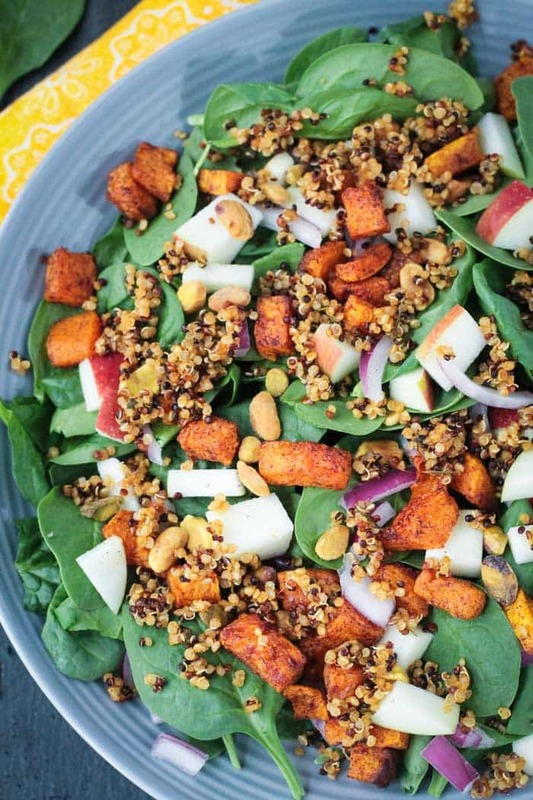 I love the apple in this salad, and warm pumpkin vinaigrette sounds amazing! Thanks! I love pumpkin and apples together! I’ve never made Pumpkin Vinaigrette before. It sounds so flavorful and making it warm over a kale salad sounds perfect. Ooh I bet that a warm dressing on toothsome kale is a great combo! It’s a great combo! Thanks, Becky! Your photography is great. Really makes the dish appealing. Of course, it sounds good, too! Thanks! I still have so much to learn about photography, but I’m getting better!